The perspective is a series of practical and logical rules according to human vision. They serve to create the illusion of three-dimensional space and depth on a flat surface such as paper. 1 – The horizon line and the level of view of our vision . The height variations of the line are adapted to the theme of the picture and expressiveness. 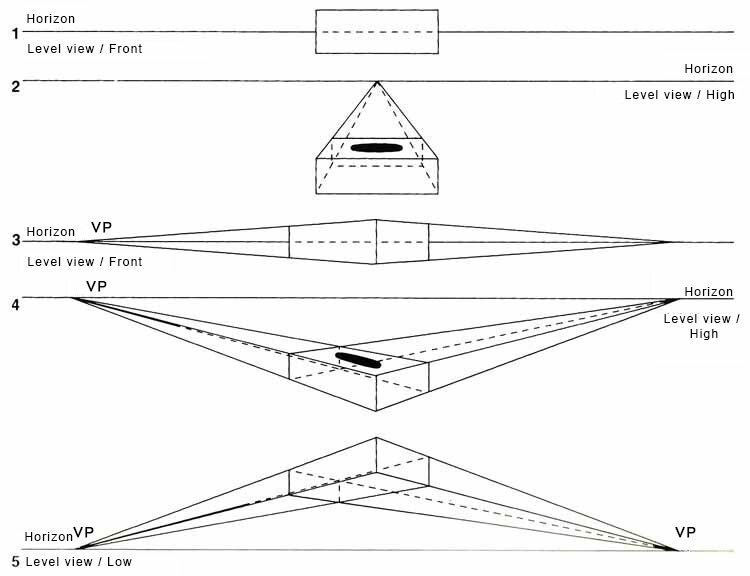 2 – Lines and depth.Positions in the visual field. Psychologically the same object placed in a higher position on the paper is interpreted at the greater distance. The converging lines are the lines that surround the viewer and drift towards the horizon. 3- The overshadow of the forms. The nearest objects overlap the most distant objects and they plug fragments of them. 4- Size differences. In the drawing of perspectives, we must avoid the excess of geometrization and avoid the excessive use of the rules of perspective. In the picture, the basics to understand the perspectives are represented. In the first image we see the horizon line without a vanishing point, because that is a front view. In the second picture there is a clear vanishing point where the lines converge. In the third, there are two vanishing points, so the scene focus on two directions. And in the fourth, the view is below, ground level view. 1- The central perspective . With 1 vanishing point. The vanishing lines are very useful to distribute the spaces and objects in depth. We use them when one side of the model is parallel to the picture plane. For example, a railroad or a tiled floor. 2- Perspective with 2 vanishing points. It is used when objects are not parallel to the picture plane. They are slanting, that is, at a certain angle of distance. 3- Angular perspective. Is used to represent a small space, like inside of a vehicle or a very small room. There is an effect of deformation, the view can not cover all the space, it would be necessary to move the head to see everything on the sides. This causes that the elements, that are outside our visual field, begin to warp and bend. The angular drawing deforms the lines as they move away from the hypothetical central vanishing point. It gives a curvature form as it approaches to us.